These are tough times here in Israel, as we confront horrendous terrorism. And what we have seen in the past several days are instances of remarkable courage and strength – positive thinking in horrendous circumstances ‒ exhibited by those who have suffered the effects of that terrorism. “Yosef was a pure soul, genuine, and beautiful. He was a sacrifice for all of Israel. We sent him to the army as a messenger for the family. “We believe in this kind of work. He observed the Torah completely, but he understood, as we understand, that in this country, unfortunately, we need a very strong army. Sgt. Yosef Cohen (to the left below) was one of two members of the haredi (ultra-Orthodox) Netzah Yehuda battalion who were killed by the terrorist last week. The other was Staff. 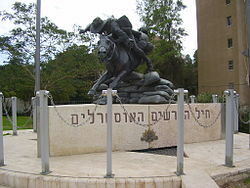 Sgt Yovel Mor Yosef. At the time I wrote, their identities had not yet been publicized. I had been under the impression that the two people wounded in that same attack were both civilians, but I was mistaken. Shira Sabag, of Beit El, indeed is a civilian, but Natanel Felber, who is in very critical condition, in a coma, is part of the same battalion. His parents are asking for prayers for him: Netanel Ilan ben Shayna Tzipora. Since that attack there was another, in the community of Beit El, on Friday. A Palestinian Arab infiltrated the community, stabbed a soldier, Naveh Rotem, and then bashed his head with a large rock. Rotem’s condition has improved and he is now listed as “moderate.” The Arab has turned himself in, apparently because he knew the IDF was closing in on him. The perpetrators of the drive-by shooting at Givat Assaf, however, have not yet been apprehended. They will be. An extensive search operation is in process, in and around Ramallah. In the course of scouring the area, the IDF has arrested a number of terrorists, most of them Hamas. It has been determined that the two terror attacks, at Ofra and at nearby Givat Assaf, were carried out by the same Hamas cell, managed by the Barghouti clan (hamula). Saleh Omar Barghouti, who was identified as having carried out the Ofra attack, was located by the IDF and shot dead last Wednesday; he is the son of local Hamas leader Omar Barghouti. On Saturday night, Mohammed Maher Barghouti was arrested. He is the brother of Marwan Barghouti, who is serving multiple life sentences in an Israeli prison. While earlier this month, former head of the Hamas politburo Khalid Mashaal called for Arabs in Judea and Samaria to prepare for “guerilla warfare” to force a “retreat” of Israelis, and ultimately “liberation” of all of Palestine. Dr. Barak Ben-Zur, an expert in strategic intelligence and counter-terrorism and former head of the Shin Bet Intelligence and Research Division, believes that Hamas has decided to keep matters quiet in Gaza and instead open up a new front in Judea and Samaria. But I think something has changed here in Israel: The people are no longer comforted by tough words spoken by our leaders. Only decisive and speedy action will make a difference. What price are we going to exact? While that Cabinet meeting was being held inside, demonstrators were gathered outside the prime minister’s office. “We are done being silent!” they said. At present the IDF is taking strong action in Judaea and Samaria, with on-going arrests and troops reinforcement, drawing on soldiers from the Golani and Nahal Brigades. But what will happen after the perpetrators of the Givat Assaf attack have been caught and the area seems quieter on the surface? Under that surface Hamas will still be lurking and planning. And so, if our government is serious, continued reinforcement of troops and extreme vigilance in patrolling and arresting Hamas terrorists will continue to be necessary for the foreseeable future. There will need to be a considerable IDF presence in all areas of Judaea and Samaria. And that is just the beginning, because there is still the issue of how to contend with Hamas inside of Gaza. Netanyahu has said Hamas cannot have “truce” in Gaza and terror in Judaea and Samaria. Does he mean this? Will he now have the backbone to stop those payments, even if Jared Kushner, Egypt, the EU and others would like them to continue? Minister Naftali Bennett and MK Motti Yogev (both of Bayit Yehudi) have for months been promoting legislation that would permit families of terrorists to be removed from their homes and relocated in another area of Judaea and Samaria within seven days of an attack. The thought is that this creates deterrence because potential terrorists might be dissuaded by realization that they would be upsetting their families. The legislation had been delayed at the request of the prime minister. Now Bennett instructed Justice Minister Ayelet Shaked to convene the Ministerial Committee for Legislation and approve the law. This is a first step, as the legislation must now move to the Knesset. The attorney-general has declared himself opposed to this legislation. Tilting left, he is opposed to a good deal. How about that? I would say that Netanyahu has seen the electoral handwriting on the wall. And then there is the issue of positive steps forward to increase Jewish presence in Judaea and Samaria. There is much that is in process now, and I will be tracking achievement. Will Netanyahu be promoting and endorsing these efforts? On Sunday the Ministerial Committee for Legislation also approved legislation that would legalize within two years 70 outposts in Judaea and Samaria that are on state land, either as new communities or new neighborhoods of existing communities. Givat Assaf is one of those outposts. This is privately sponsored legislation – advanced by MK Bezalel Smotrich (Bayit Yehudi) and MK Yoav Kisch (Likud), chairs of the Knesset Land of Israel Caucus. It, too, must be advanced to the Knesset. The goal is to ensure that all outposts are legalized regardless of the government stance. During the course of the two years, the government would be required to treat the outposts as if they were already authorized, with regard to such matters as providing utilities. And it would halt enforcement of all actions against the outposts during that time. Tags attacks cannot be allowed to become part of daily life Belief that the increased Hamas violence in Judaea and Samaria has been motivated and funded by the $15 million in Qatari funds that Israel has permitted Israel is in a war with terror and need to act as one acts in war Judaea and Samaria Minister Netanyahu conveyed a clear message to Hamas Mohammed Maher Barghouti arrested murders terrorism terrorists the IDF has arrested a number of terrorists most of them Hamas. Previous How Amiad Yisrael Z’L, a Three-Day-Old Baby, United the Jewish People. Next ZFA Response to ALP- Australian Labor Party, National Conference.